100% smooth weave polyester with clean finish seams. Fully lined. Reinforced embroidered stitching. Fine polyester fringe. Save over 70% off competitor's pricing! 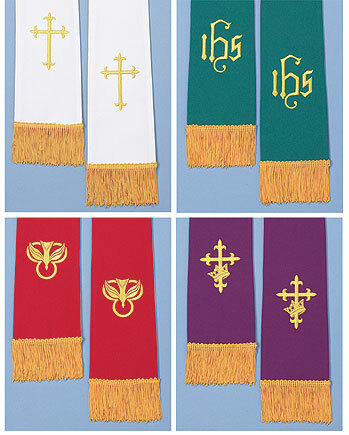 This set of 2 reversible stoles has appropriate symbolism and colors for most seasons in the church year. They are perfect for Ordinary times, Pentecost, Confirmation, Epiphany, Lent, Advent, Christmas and Commemoration Sundays. Reversible stoles match reversible paraments.